Thodupuzha is the largest town in Idukki district of Kerala state. It is also the fastest growing town in Kerala and the main commercial centre in the district. 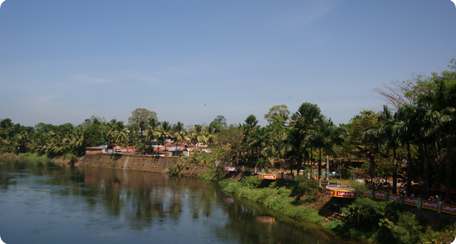 The name of the river flowing through the centre of this town is also known as Thodupuzha. Thodupuzha is blessed with natural scenic beauty and is ideal for all nature lovers. The name 'Thodupuzha' is considered to be derived from two words, 'thodu', which means a small stream and 'puzha', which means a river. It is believed that the streams nearby today's Thodupuzha developed into a river, and the town on the banks of the river came to be known as Thodupuzha. There is another version which defines the word ‘thodu’ as ‘touch’ and ‘puzha’ as ‘river’. Thus the town touching the river became Thodupuzha. Thodupuzha is an ancient town with a history dating back to many centuries. The Buddhist and Jain religions which made their first inroads into Kerala in 300 BC have left their impact at Thodupuzha and neighboring areas. The Buddhist religious relics found at Karicodu near Thodupuzha is ample proof of this surmise. Upon the formation of Kerala state in 1956, Thodupuzha was part of Ernakulam district. In the year 1972, Idukki district was formed by joining Thodupuzha taluk along with Devikulam, Udumbanchola and Peermade taluks, which were part of the erstwhile Kottayam district. Thodupuzha’s economy is driven by agriculture, business and small industries. Farmers in Thodupuzha raise a number of agricultural products such as variety of crops, pineapple, coconut, rice, pepper, coco, tapioca, rubber, banana, ginger, turmeric, etc. are also being cultivated in plenty. In recent years Thodupuzha has shown more interest in promoting tourism.